Like most photographers, there is almost no end to the types of things or events I photograph. When I’m not working with people, I like to experiment with macro, or extreme close-up photography. Flowers happen to be a particular favorite of both Cassandra and I, but we rarely have an opportunity where we do it together. A few weeks ago we had one of those rare opportunities as we took in the Pacific Orchid Exposition in San Francisco. This was the first time either of us had attended the three-day event. The variety of orchids on display was incredible. The colors and types ran from the ordinary to the exotic. 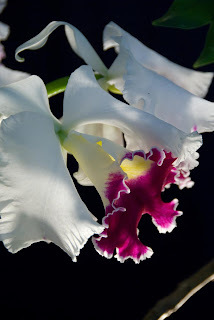 Hybrids and crossbreeds were featured alongside traditional orchid strains from orchid growers from all over the state. The massive Festival Pavilion at Fort Mason was filled with the delicate flowers, all in bloom. Those that were so inclined could also take the experience home with them as 2/3rds of the space was dedicated to orchid sales. Of course, we took lots of pictures. We weren’t alone as local photogs maneuvered their tripods around the hundreds of attendees to get shots they weren’t likely to set up on their own. In fact, everyone with a digital camera brought them out to take home souvenir images from the event. Even with automated flash on a point-and-shoot digital, excellent images were just the click of a shutter away. Of course, the preferred method is to use ambient light. Fortunately, we were there on a sunny afternoon and the high windows let in plenty of light. Some of the exhibitors enhanced their displays with a variety of different types of floodlights. Without going into a lot of technical details, some of the lights enhanced images; some did not. In any case, I’m sure everyone came away with some good pictures. We shot mostly natural light close-ups. I brought along a small “sun gun” light to fill in some of the shadow details, and in some cases, create some special effects. Most of the exhibits placed the flowers at leas a couple feet away from each other, and mostly against a black background. In almost no time at all, we came away with over 300 images. You can check out some of them at our online gallery: exclusivephotos.smugmug.com. Some will show up in our Fine Art Greeting Card line, Polyrhythmic Expressions. Perhaps I’ll make a book from these and some of the other flower images I’ve taken over the years. Looking for a great subject to practice your own photographic skills? You can’t beat flowers for still life images. You can try a lot of different ideas and techniques, and will very likely have some great results.